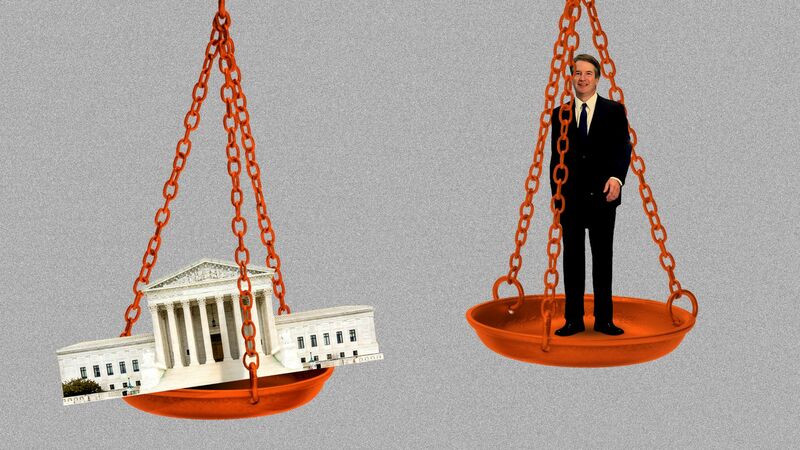 1 big thing: Brett Kavanaugh is "too big to fail"
"He's too big to fail now," said a senior source involved in the confirmation process. "Our base, our voters, our side, people are so mad," the source continued. "There's nowhere to go. We're gonna make them f---ing vote. [Joe] Manchin in West Virginia, in those red states. Joe Donnelly? He said he's a no? Fine, we'll see how that goes. There will be a vote on him [Kavanaugh]. ... It will be a slugfest of a week." This scenario seemed unthinkable a month ago, but it's now being privately discussed by sources involved in Brett Kavanaugh's confirmation: If Kavanaugh falls after the FBI investigation this week and Democrats flip the Senate in November, will Trump nominate a compromise Supreme Court justice who's acceptable to Senate Democrats? The answer: No way, according to sources with direct knowledge of the president’s thinking, both inside and outside the White House. "If Kavanaugh doesn't make it, it all depends on the midterms," said one of those sources. "If they hold the Senate, OK, regroup, put somebody up next year or maybe end of this year. "But if he [Kavanaugh] doesn’t make it and the Senate flips, I think it's 4-4 for next two years. "Politically, I think they would rather keep it 4-4 rather than put somebody acceptable on the court," the source added. "He [Trump] needs to run on polarization and the court in 2020." One of Trump's most trusted advisers told me he'd counsel Trump that if Democrats win the Senate, under no circumstances should he nominate a compromise candidate. A senior administration official close to the process told me: "A 4-4 tie is a conservative win. Not as much as a 5-4 majority, but it takes constitutional interpretation out of D.C."
And a White House official told me Trump has made clear he'd nominate somebody in Kavanaugh's judicial mold no matter what happens in the midterms. "He sees it as a fundamental promise," the official told me. "They [Democrats] are not going to be rewarded for this. He's not going to undercut allies and reward enemies." The question became more urgent after Republicans eventually asked President Trump to order a "limited" one-week FBI probe into the sexual assault claims against Kavanaugh. "We believe the policies that are being pursued [by Israel] are not sustainable," Zarif told me and a small group of reporters who met with him at the Iranian Mission in New York. Trump's negotiating team was working under the theory that they had to sign the new NAFTA agreement on Nov. 30 because the incoming Mexican leftist leader Andrés Manuel López Obrador, who takes office in December, would not sign NAFTA 2.0. Trade Promotion Authority rules dictate that the U.S. government must release text of any new agreement 60 days before signing — and that's midnight tonight. Bottom line: A new NAFTA deal between the U.S., Canada and Mexico seems close, even imminent. But it's unclear, as of 4 p.m. today, the extent to which these disagreements are substantive or of a technical nature. 6. U.S. government to stay open! All that talk of a government shutdown evaporated last week, as Trump honored his promise to Mitch McConnell and Paul Ryan to avoid a shutdown fight over the wall. Today is the end of the fiscal year, and not only will the government remain open, but the Republican-controlled Congress has sent more spending bills to the president's desk than in any year for a couple of decades. Trump has signed the following spending bills into law: Defense, Legislative Branch, Military Construction/VA, Energy and Water, Labor, Health and Human Services, Education, and related agencies. "For the first time in a decade, our military won't have to operate under a continuing resolution with uncertainty while making national defense decisions," said Ryan's spokeswoman AshLee Strong. The House is on recess until the midterm elections. The Senate waits to vote on Brett Kavanaugh while the FBI conducts its limited, weeklong investigation. In the meantime, the Senate will vote to end debate on the long-term FAA reauthorization bill. Monday: Trump has lunch with Mike Pence, presents the Medal of Honor, hosts a roundtable with supporters followed by a campaign rally in Johnson City, Tennessee. Tuesday: Trump delivers remarks at the Electrical Contractors Association Convention in Philadelphia, hosts a roundtable with supporters followed by a rally in Southaven, Mississippi. Wednesday: Trump receives his intelligence briefing, has lunch with Secretary of State Mike Pompeo and meets with UN Ambassador Nikki Haley.